How can I find my followers skills and stats? I have Sven as my follower at the moment and I've given him some Elven Armour (Light) and an Ancient Nord Battleaxe (2h), but I have no idea if these items work for him or not. Do the followers have stats and skills already? I read on the wiki that Lydia is a good thief, and I know Sven is a bard. If he's a bard, then Bow and Dagger surely? Or do followers work like the player and what items you give them shape their skills? Followers are generally given a set of skills that will improve, regardless of what you equip them with. These will improve with level, but nothing else will. Faendal is always going to do better with bows than with a greatsword, for example. It's not clear where the rumor that Lydia would make an excellent thief started: UESP mentions she has the sneak skill on the list of followers (I suspect that's where Wikia pulled the information), but her wiki page clearly marks her as a warrior (the correct designation). Nothing about her says "stealthy": she starts with a sword and board and tells you over and over that she's there to protect you. While the official strategy guide does list what each follower's skill is, with the exception of Lydia, UESP's version matches up with the strategy guide, so it should be pretty accurate to determine what skills your follower has. But if you wanted to do it without consulting a guide or a wiki, it's generally common sense and usually based on what equipment they come with. Lydia comes with a sword and shield, so her skills are one-handed and block; Faedrun comes with a bow, so one of his skills is archery; and so on. All followers have different stats that are determined by their level. Their level is fixed as soon as you enter the zone and the NPC is loaded. Once that happens, you cannot change their proficiencies without the console. Move up to the NPC you want to query. Open up the console and click on them. There should be a small text string that shows up in the console, that is their unique ID. You can use the command: showinventory to see what their default armors are, even if it doesn't show up when you ask them to open their inventory in the dialog menu. After this, the follower should be scaled to what your character's level is. 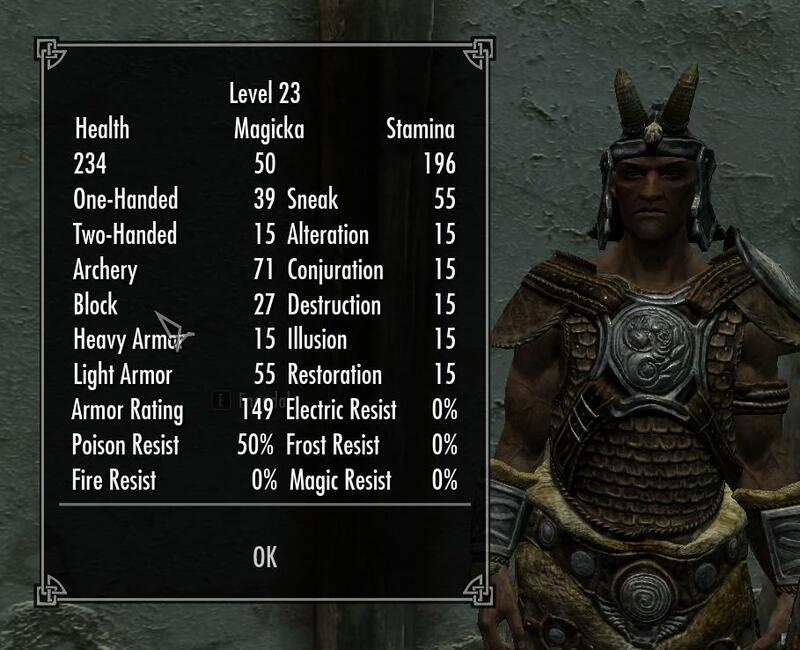 Most followers in Skyrim favor certain skills over others. For example, Aela typically has high marksmanship, light armor, and sneak. However, her default armor is heavy armor, so it helps her survivability a lot if you give her light armor to replace her default armor. That's not entirely true about that they would use the item or armor whichever has the highest Atk/Def rating. For example I wanted to give Janessa a steel armor but she kept wearing leather armor. However as I gave her plate armor she used that instead, so i guess the level of her armor skill plays a role too, same goes for weapons. Every follower has a certain set of skills from the start. Since Skyrim patch 1.6 they also level with you. You can find the the professions of every follower at the UESP and wikia wikis. There is a mod named Ask Follower Skills (Nexus/Steam) to check out the current stats of your follower. You need just 2 commands: getav and setav. You will get the amount of this character's health. For example, it might give back 80.00.
and voilà, the character will have 10 000 life! You can do this with any other skill or attribute you need. I tested it and works perfectly! However, I suggest that you do not overdo it, because it'll become boring. For example, I gave my 2 followers 250 health each; I didn't want them to be monsters. For more information on the getav and setav commands, refer to the related pages on the Elder Scrolls Wikia or the UESP. Do followers have skill levels and level similar to my characters? How to make your followers craft? Is it possible to find out what level your follower is on? How will the race I pick affect quests and skills? How can I see my unbuffed stats? In Skyrim, how many followers can I have? And where do I get them? How do I assign a single Keystroke to multiple items? Is it feasible to play a MagiSassin(tm) in Skyrim? What potions can my followers use? How can I force unlimited arrows followers?